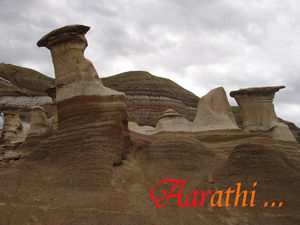 Hoodoos site is located 16 km south of Drumheller. Hoodoos are strange pillars resting on a thick base of shale that's capped by a large rock. Fossilized dinosaur bones found in this region are in the Royal Tyrrell Museum. This yet eerie landscape of the Canadian Badlands can be seen in Drumheller, East Coulee, Lehigh, Cambria, Rosedale, Wayne & Nacmine. The Dinosaur Provincial Park is a United Nations World Heritage site.